The Journal has been issued since 1887. 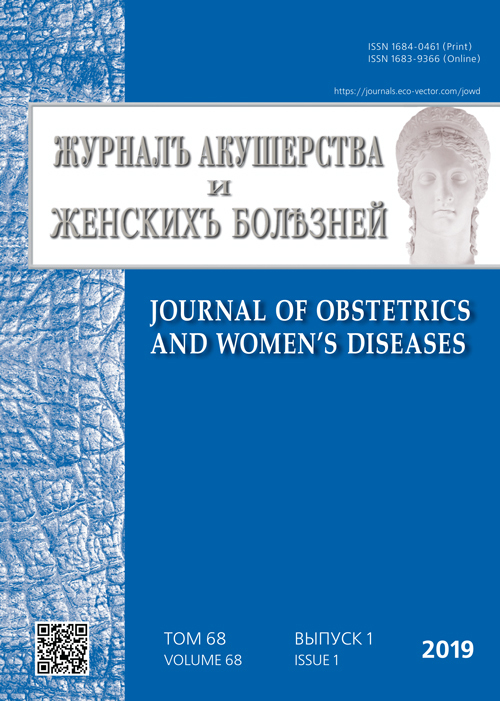 It is the first scientific journal in Russia for obstetricians and gynecologists. For over a century, the Journal regularly covers the latest achievements of Russian science. Journal of Obstetrics and Women's Diseases, a Gold Open Access journal, publishes six volumes per year. Additionally, the Journal will publish occasional special issues featuring selected papers from major conferences. impact of harmful environmental and production factors on the female reproductive system. The main mission of the Journal is to provide new scientific and technical information, to promote scientific knowledge, to help obstetricians and gynecologists to choose the best methods of diagnosis and treatment, and to help improve their skills. The publications of the Journal are of interest to a wide range of scholars in the field of obstetrics, gynecology, reproduction, genetics, pathology, and immunology of reproduction, as well as for medicine and biology tutors and students. Tolibova G.K., Tral T.G., Ailamazyan E.K., Kogan I.Y. Kostroma Y.V., Belyaeva E.N., Khazova E.L., Kuznetsova L.V., Zazerskaya I.E. Kuzminykh T.U., Borisova V.Y., Nikolayenkov I.P., Kozonov G.R., Tolibova G.K.
Morozova A.Y., Milyutina Y.P., Kovalchuk-Kovalevskaya O.V., Arutjunyan A.V., Evsyukova I.I. Shkarupa D.D., Kubin N.D., Popov E.N., Shapovalova E.A., Zaytseva A.O. Durneva E.I., Sokolov D.I., Yarmolinskaya M.I., Selkov S.A.
Sazonova N.G., Makarenko T.A., Olovyannikova R.Y., Kutyakov V.A., Salmina A.B. Tapilskaya N.I., Gzgzyan A.M., Kogan I.Y.